Off-road Wheel Spacers are the ULTIMATE off-road accessory for your Jeep, Toyota, Suzuki, Bronco, or Land Rover. Perfect for adding side angle stability to a lifted truck. Don't forget to make it wider to accomodate the added lift! A great alternative to new off-set wheels, and when you change your truck, you keep your spacers for the next one. . . Better cornering at high speeds. Easy bolt-on installation in minutes. Note: This is a stock item, and ready to ship. .
CJ, TJ, XJ, YJ, ZJ, KJ, WJ - Our off-road wheel spacers are machined from T6061 billet aluminum. Each wheelspacer is stud-centric for a perfect fit. 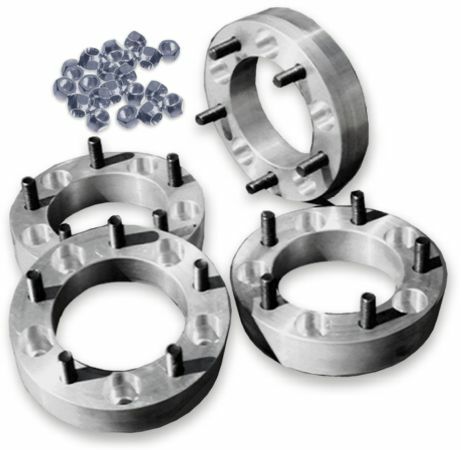 Set of 4 spacers per set. 5 on 4.5" bolt pattern - Jeep XJ, YJ, TJ, ZJ, and KJ. 5 on 5.5" bolt pattern - Jeep CJ (and Samurai). Available in: 1 1/4" and 1 1/2" widths. Available in 2" width on request. 5 on 127mm now also available for WJ in 1 1/2" width. . Installing the off-road wheel spacers is straight forward. Just like mounting a wheel, bolt them in place, tighten the lug nuts to the correct wheel torque (ft/lbs) and install the wheels on the spacers in the same manner. The important thing to remember is that you need to check the torque on the wheel spacers periodically as they can come loose, just as you should check the lug nuts on your wheels. 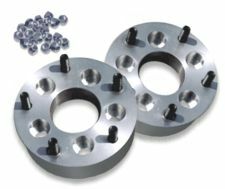 Our off-road wheel adapters will adapt your 5 on 4.5" (Jeep XJ, YJ, TJ, ZJ, KJ) bolt pattern hub to fit a 5 on 5.5" (Jeep CJ) bolt pattern wheel. Our off-road wheel adapters are machined from T6061 billet aluminum. Each wheel adapter is stud-centric for a perfect fit. Set of 4 adapters per set. Use CJ wheels on a TJ. Available in 1 1/2" width. . Installing the off-road wheel spacers is straight forward. Just like mounting a wheel, bolt them in place, tighten the lug nuts to the correct wheel torque (ft/lbs) and install the wheels on the spacers in the same manner. The important thing to remember is that you need to check the torque on the wheel spacers periodically as they can come loose, just as you should check the lug nuts on your wheels. . . This IPF High Performance driving light produces a driving beam and a fog beam simultaneously thanks to a state-of-the-art hybrid reflector. .